Evidence-Based Approach to Surgery and Rehabilitation of ACL Injuries CE Course with exam provides athletic trainers and therapists with a complete review of literature on rehabilitation techniques and surgical options for treating ACL injuries. Optimally apply therapeutic exercises and modalities after anterior cruciate ligament reconstruction. Discuss the importance of psychological outcomes among patients with anterior cruciate ligament injury. Describe the pros and cons of various anterior cruciate ligament graft options. Identify emerging trends in surgical techniques for anterior cruciate ligament reconstructions and describe how they compare to standard techniques. More than 250,000 ACL injuries occur every year, so athletic trainers, physical therapists, and others who work with athletes need to be well versed in the rehabilitation techniques and options in surgery for treating ACL injuries. 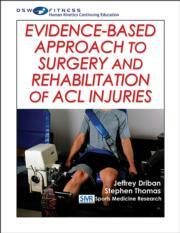 Evidence-Based Approach to Surgery and Rehabilitation of ACL Injuries CE Course provides practitioners with a comprehensive review of the literature surrounding the most common and effective surgical procedures and rehabilitation practices for ACL injuries. This continuing education course presents 20 research articles regarding ACL injury treatment with the goal of demonstrating how athletic trainers and therapists can use existing studies and apply the information to their own practice. The articles are followed by an exam containing 100 questions. Upon passing the exam, users may print out and submit a certificate for continuing education credits. After completing this continuing education course, athletic trainers and physical therapists will be able to apply therapeutic exercises and modalities during ACL reconstruction with the ultimate goal of helping clients and athletes return to their preinjury activity levels. Additionally, the psychological outcomes among patients with ACL injury are discussed, including the fear of moving and causing reinjury to a recently repaired ACL. The surgical side of ACL rehabilitation is also examined through various graft options as well as the emerging trends in surgical techniques for ACL reconstruction and how they compare to standard techniques. The aim of this course is to help practitioners educate their patients about short-term and long-term outcomes after ACL injury. Evidence-Based Approach to Surgery and Rehabilitation of ACL Injuries CE Course supports the initiative in the athletic training profession to integrate the best new research and evidence into clinical decision making with the goal of improving patient outcomes. Certified athletic trainers completing this course may earn continuing education units to apply toward the required evidence-based practice category to maintain their certification. Article 7: What’s Really Causing Those Knee Stability Deficits After ACL Reconstruction? Article 15: Is the Double-Bundle ACL Reconstruction Appropriate for Everyone? Article 18: Calcium Phosphate Soaking to Improve Healing of ACL Tendon–Bone Graft? Driban received his bachelor’s degree in athletic training from the University of Delaware. During his doctoral training at Temple University, he focused on various aspects of osteoarthritis (e.g., early pathophysiology in animal models, biochemical markers in joint fluid, systematic reviews of risk factors for osteoarthritis, survey of medication use among patients with osteoarthritis). In January 2010, he began a postdoctoral research fellowship in the division of rheumatology at Tufts Medical Center, where he continued his focus on osteoarthritis and learned new surgical strategies in magnetic resonance imaging. Also available as part of a bundle. View bundle product page.